What conversion type is right for you? Get to know your conversion options. What kind of an accessible vehicle are you looking for? Purchasing an accessible van is a large investment, so you will want to consider your short-term and long-term needs. Accessible vehicles come with various features and benefits, and the one that fits your needs may be based on mobility devices such as a motor or manual wheelchair, vehicle features such as hand controls, or who will be the primary driver. When you begin your search for an accessible vehicle, you may not know what type of vehicle you will need. The right accessible vehicle may be a full-size van, a converted minivan, a truck or an SUV. Folding ramps may retract from the side, back, or from the floor of the vehicle. Before you make a final decision, take time to decide what your needs are, talk to other families using an accessible vehicle, and speak with your local dealer. Side Entry conversions allow for access from the side of a vehicle. Typically, the floor of the van is lowered allowing for more headspace to fit wheelchairs. Side entry vans usually house foldout ramps and lifts or in-floor ramps. Another popular option is a center cut conversion. Side entry vans tend to be easier for curbside access for picking up/dropping off passengers. Side entry vehicles usually have seats that can be removed, providing options for the wheelchair user to either ride in the passenger seat or drive the vehicle. Over 75% of non-commercial wheelchair accessible vehicles utilize a side-entry configuration. Additional room is needed to deploy the ramp. These types of vans most often require handicap spaces or driveways wide enough to accommodate the van. The middle or second row of the van will need to be removed to account for the conversion. This can be problematic in the event that the vehicle is used to transport additional passengers who aren’t wheelchair users. There may be a reduction of space in the vehicle, due to the wheelchair being larger than average, or if the wheelchair user seats him or herself higher in the wheelchair. 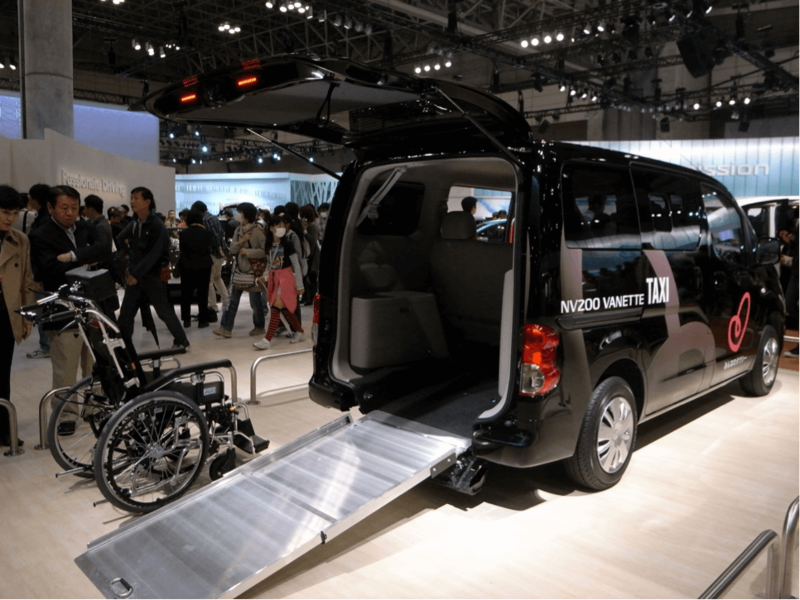 Rear-entry conversions feature a foldout ramp with a lowered center area in the van designed for a motor or manual wheelchair entry. No additional room is needed for a ramp. Side doors do not have to be blocked if a folding style ramp is utilized. This conversion requires less modification of the van, and side/middle seats can remain intact for additional passengers. This configuration can be used for wheelchair users who are not the driver, such as a young child. Due to the rear-entry floor being lowered either behind the middle seat or driver/passenger seats, the wheelchair occupant cannot operate the vehicle or sit in the passenger seat. Only if the wheelchair user can be moved into the driver or passenger seat can the factory seats be used. Parallel parking can be challenging due to the access needed behind the vehicle. Mini-vans are not the only options for accessible vehicles. Trucks, full-size vans, and SUVs are other options. In-Floor: The wheelchair ramp is stowed in the floor of the van, creating more interior room. When not being used, they are stored alongside the door of the van. Entering and exiting is easier for non-wheelchair users. When stowed, they are not seen. If there is uneven terrain, in-floor ramps are easy to use. The angle of in-floor ramps is higher than fold-out ramps, making entering/exiting slightly more difficult. Because of its location in the floor, it may require more maintenance and cleaning. Fold-Up: These ramps fold out when extended and rest next to the sliding door when they are not being used. A wheelchair user can assist the folding out of the ramp if there is need for it. Due to the perforations in the ramp allowing gravel and dirt to fall through, less maintenance is required. Many users state the lower angle is preferential. Because of the fold, rough terrain may hinder the folding out. The seat in front of a fold-out ramp cannot recline when the ramp is not being used. When non-wheelchair users need to enter and exit, the ramp still needs to be deployed. Manual: Since there are fewer moving parts, these usually cost less to install and maintain. However, they are usually used when an attendant is present in order to assist, and A wheelchair user may not be able to operate the ramp while seated in their wheelchair. Automatic: While convenient for those who do not have an attendant, automatic ramps could cost more and require additional maintenance. Hand controls provide assistance to users with limited foot control. Swivel seating allows for a driver's seat to lower to outside of the vehicle, giving a driver accessibility to the front seat. Researching what options fit your mobility needs will enhance your independence when you need to get from here to there in your community. Click the dealers tab to contact your local wheelchair van dealer to see which option will best meet your needs.